Greetings and welcome. I am K, and I have been playing Summoners War, 100% F2P, since August 2014. While I may not be a top ranking player or a particularly renowned figure, from time to time I do take some enjoyment in playing around with this analytical stuff. The purpose of this guide is to analyze and determine the best set of runes for a standard damage dealing attack monster. We will be looking at the average damage produced by 12 combinations of runes in 2 different grades. Please be aware that certain arbitrary values will be used to simulate realistic builds and situations. The keyword to remember is “reasonable”. Obviously there are some variables that need to be omitted, because they are either too situational or uncontrollable. Let us begin our quest to end this debate. For the purpose of this analysis, we will use a hypothetical monster with 845 base ATK, and the standard starting CR and CD of 15% and 50% respectively. Why 845? 845 is exactly 2/3 of the way up from the lowest base ATK and the highest base ATK in the game. This is the standard I will use for a “pretty good 6-star attacker”. Further testing indicated it does not actually matter what number we choose for this, as we mostly deal with multipliers. We will mainly compare the rune sets Fatal/Blade, Rage/Blade, and Violent/Blade. Note that Violent gives a chance for extra turns with an expected value of about 24.85%. We will also list an “other” set, which are rune sets that don’t affect damage, such as Despair and Vampire. As Blade is less commonly used with “other”, it will be excluded. 3 different runes will be tested in slot 4 for each set: ATK%, CR, CD. For all combinations, ATK% runes will be used in slots 2 and 6. To help accommodate both endgame players and players who are still making their way up, we will run the same calculations using 6☆ runes and 5☆ runes. In addition, we will assign the following extra stats, which covers potential substats and stat buffs from buildings: 70% ATK, 24% CR, 80% CD for 6☆ setups, and 35% ATK, 12% CR, 40% CD for 5☆ setups. These values are proportional with rune set bonuses, and are sufficiently balanced and realistic. The following table summary excludes Fatal and Rage set bonuses and slot 4 stats. Now, we consolidate the base stats and the rune stats. This will be our starting point. Bear in mind that, despite the RNG’s often ridiculous effects, we are mainly comparing averages produced by an infinite number of hits. In the following tables, the highest value under each star grade will be in bold. I feel at this point I should spoil something a lot of you have probably guessed: Violent will technically win in every case we test. However, at the end I will explain why it still may not always be the best in practice despite being mathematically superior to Fatal and Rage. For now, I will also highlight the highest non-Violent value in bold italics. The biggest surprise here is the effectiveness of CR in slot 4 regardless of the rune set. Next to Violent/CR, Rage/CR in slot 4 generates the highest output, even though excess CR beyond 100% does absolutely nothing. If you can reach the CR cap without Blade, you have an opportunity to try things like Energy, Focus, or even Revenge. Next, let us examine a common yet rarely considered scenario: attribute advantage. With 24% wasted CR, Violent/CR has surpassed by Violent/CD. Interestingly, Rage/CR still holds runner-up. Since the 5☆ setups do not have any excess CR, Violent/CR and Rage/CR are still the top performers there. What if we take it a step further and add another 15% CR as an awakening bonus? We now have very high starting CR, making slot 4 CR runes obsolete. The marginal benefit of CD has increased, so Violent/CD and Rage/CD lead. At 5☆ though, Fatal/CD compensates for the loss of ATK from both slots 2 and 6. Remember that our beloved and hated Theomars fits this example perfectly, as he has both an awakening CR bonus and attribute advantage against everything. For those of you who use SPD in slot 2, Fatal helps to make up for the lost ATK, but I highly recommend Violent if possible, as it scales better with SPD. A final scenario we will explore is the unfavorable case of attacking someone with critical protection. Susano, Acasis, Jubelle, Guillaume, Dias, etc. are able to cut your total CR in half. While it may not be problematic enough to justify changing your runes, we will take a look anyway for completion’s sake. With total CR drastically reduced, CD has also lost much of its power. Despite being half as effective, it seems additional CR still gives the highest return. Violent/CR and Rage/CR are the top picks, as in the first test. For 5☆, Fatal/CR beats Rage/CR just barely, due to the low total CR. Honestly, this worst case scenario is probably not something for which you should spend too much effort to prepare. As pointed out in the beginning, while Violent setups performed mathematically better in every test, they are not strictly better in every real situation. Yes, in a long enough battle, Violent allows the highest damage over time. However, what if your attacker is not meant for consistent damage output? What if you absolutely needed that one hit to count, and could not leave it to chance? Fatal and Rage help to ensure your Katarina and Lushen make their kills when you need them to. When choosing the most effective runes for your attackers, there is no single correct answer. There are simply too many variables that affect the outcome. I even skipped glancing hits because I value my sleep more. This guide merely offers a rough idea of what to choose, based on a hypothetical set of reasonably realistic numbers. If your stats are more balanced or more lopsided than the example, you would have to adjust for those differences. 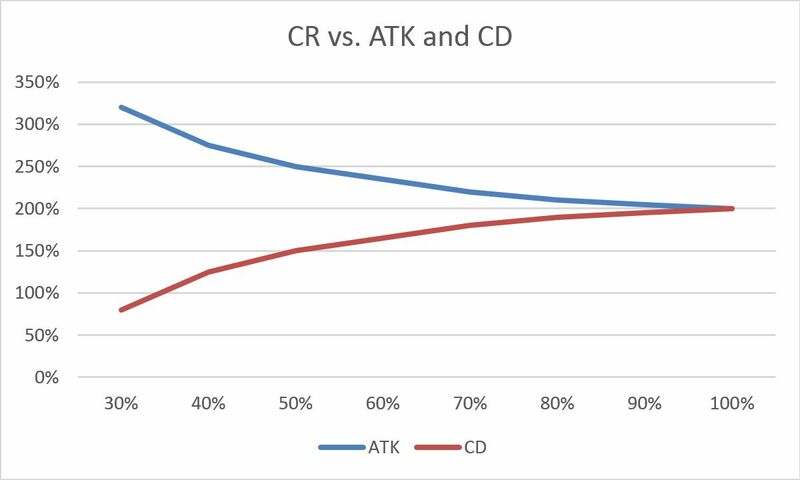 To help answer the common question of how to balance ATK and CD at various CR, the following chart illustrates an example that assumes you have a total of 400% you can freely distribute to either ATK or CD. Thanks to my guildmates for their support and encouragement, especially to Fodder and Norad for contributing their ideas. Extra special thanks to Jerrod for debating with me in guild chat (in your face), and to Miko for keeping the peace. Finally, thank you all for reading. Your questions and feedback have helped a great deal in improving this guide. Good luck, and happy farming!